If you’re a “meat and potatoes” type of eater, then this Meat and Potatoes Bake is the perfect dish for you! 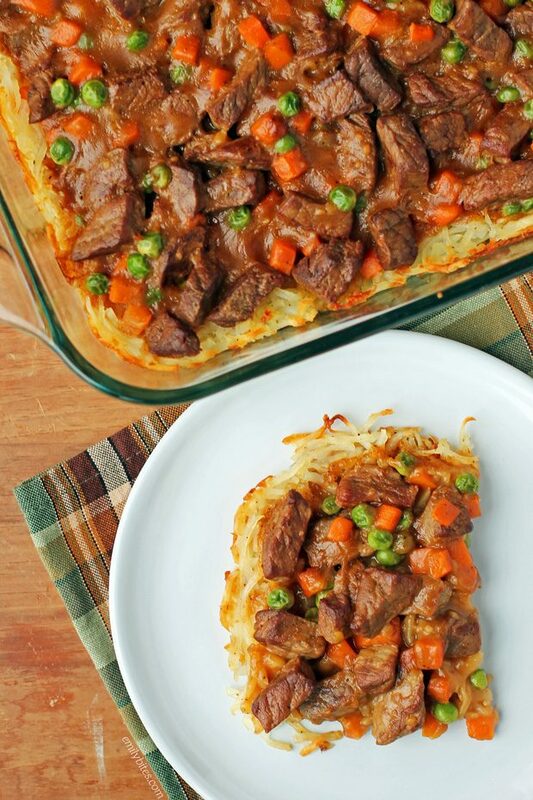 With an easy, shredded potato base topped with peas, carrots, and chunks of seared steak, all smothered in a rich beefy gravy, this is old-school comfort food with a new twist. When I described my idea for this recipe to my husband he said “so, kind of like an upside-down shepherd’s pie?” I hadn’t thought of it like that, but yeah, kind of like that! I personally love anything that’s smothered in gravy (it’s my favorite part of the Thanksgiving meal), so this totally hit the spot for me. We’ll definitely be making this again and again! Looking for more lightened up comfort food casseroles? Check out my Bubble Up Chicken Alfredo Bake, Cottage Pie, One-Pot Cincinnati Chili Spaghetti Bake, Cheesy Buffalo Chicken Potato Bake, Chili Cornbread Bake, Layered Chicken Enchilada Bake, Teriyaki Chicken and Rice Casserole, Eggplant Parmesan Casserole, Bubble Up Chicken Pot Pie Casserole, Cheesy Cajun Beef and Potato Bake, Chicken Parmesan Quinoa Bake, Bubble Up Pizza Casserole, Chicken Cordon Bleu Pasta Bake, Spaghetti Pie, Deep Dish Sloppy Joe Casserole and many more in the Casserole section of my recipe index! Pre-heat the oven to 375. Lightly mist a 9×13 baking dish with cooking spray and set aside. Place the shredded potatoes in a large mixing bowl and drizzle with 2 tablespoons of the oil. Add the salt and 1/8 teaspoon of the pepper and stir together until ingredients are well mixed. Transfer the potatoes to the baking dish and press them down across the surface of the dish and partially up the sides to form a “crust” along the bottom of the pan. Place the dish in the oven and bake for 35 minutes. While the potatoes are baking, bring 4 tablespoons of the butter over medium heat in a medium saucepan until melted. Add the flour a little at a time, whisking it into the butter until combined. Cook for 2-3 minutes, stirring regularly. Reduce the heat to low and add the broth a little at a time, whisking it into the flour mixture until smooth and well combined. Add he gravy master sauce. Increase the heat to medium and stir regularly until gravy boils and thicken. Remove from heat. Pour the remaining tablespoon of oil into a saute pan or large skillet and add the remaining tablespoon of butter. Bring high heat or just under high. Add the steak cubes in a single layer and sprinkle with salt and pepper to taste. Allow the steak to sear for about 2 minutes and then flip it to sear the other sides until the outside of the cubes are browned. This will happen quickly over the high heat. Don’t worry if the inside of the steak is not cooked through, it’s going in the oven. Remove the steak from heat. Add the gravy and the peas and carrots to the steak and stir to combine. When the potatoes are done, remove them from the oven (edges will be starting to brown). 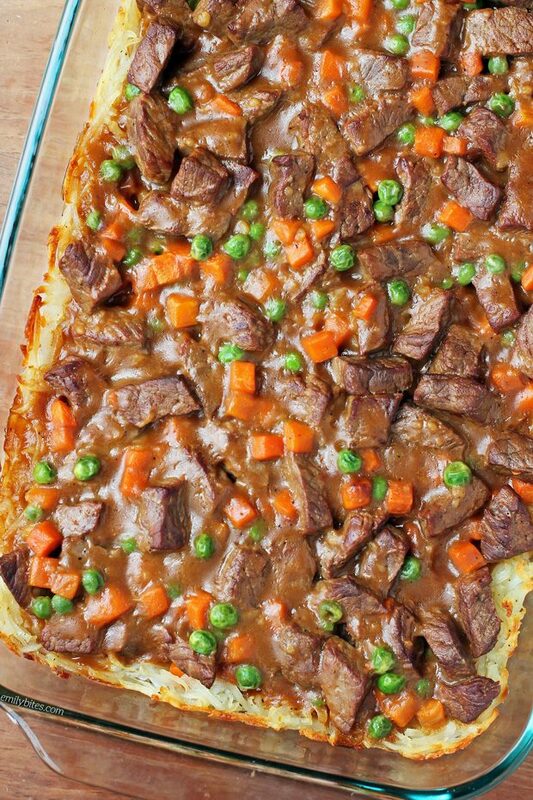 Spoon the steak and veggies onto the potato crust in an even layer and follow with the rest of the gravy. Return the dish to the oven to bake for another 15-20 minutes. Allow to cool for a few minutes and slice into 8 equal pieces to serve. Where can I find Gravy Master seasoning and browning sauce? This sounds SO good. It’s in pretty much every grocery store. Try near the broth or sauces? I hope you love it! I found it near salad dressings, steak sauce, vinegar aisle in Walmart. I love casseroles! I have almost everything to make this already – can’t wait. You should do a turkey/dressing/cranberry something casserole for Thanksgiving leftovers! 🙂 Love all of your stuff – you make weight watchers do-able. If you can’t find Gravy Master, what can be used in its place? There are other brands that make the same thing like kitchen bouquet. If you live in America I promise they have some at your grocery store! Writing down all the ingredients to pick this up at the store today. Love the hashbrown base!! Just made this for dinner tonight and it was delicious. It got rave reviews from my husband who loves shepherd’s pie and he went back for seconds. I was pleasantly surprised how tender the meat was too. Made this for our family and it was delicious! I will make this again. I made this tonight and it was good, but the potatoes didn’t firm up at all. I cooked them for 35 minutes and they were browning on the edges. Should I have cooked them until the entire pan was browning before adding the rest? How much is in a serving – one cup / two cups ? How much is a serving???? I haven’t tried this yet, but just wondering from anyone who has, would adding some corn be good as well? Thanks! This is the yummiest most delicious comfort food I’ve had since starting weight watchers! thank you so much for your wonderful recipes and hard work! Made this one for dinner last night and I love it! Thanks!